Disclaimer: There are a hundred ways to brew a cup of coffee just like there are a hundred ways to cook an egg. 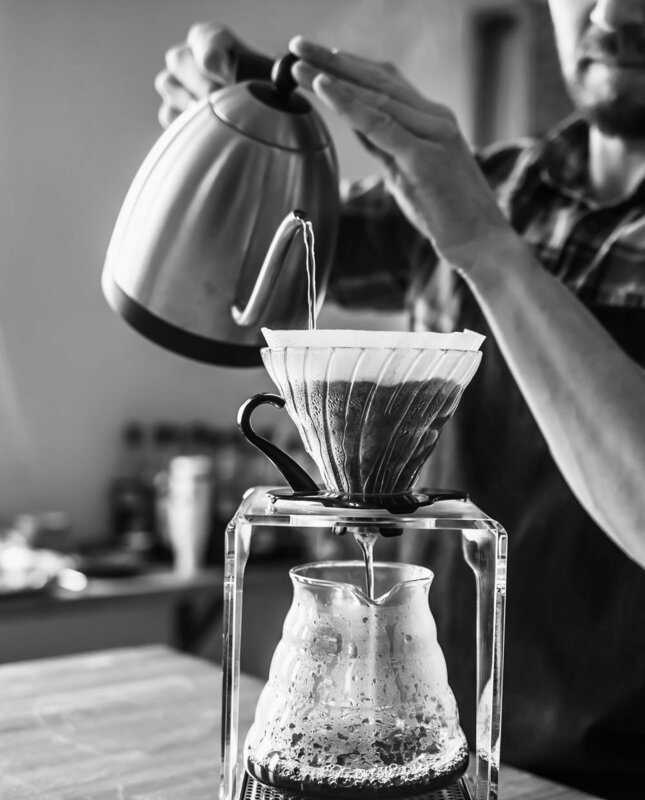 We can provide a rough guide based on our experience and SCAA guidelines, however, you should tweak the process to your heart's content in order to find your coffee sweet spot. We will aim for a 17:1 ratio (17 grams of water for every 1 gram of coffee). Therefore, you will need around 15 g (2 large table spoons) of coffee for 250 ml (average coffee mug size). Step 1: Heat your water and bring it to a boil. Step 2: Place your #2 filter in the dripper. Place dripper over your mug. Without any coffee in the filter, pour some of the hot water over the filter and into the mug. This does three things: 1. It will make it easier for keeping the filter in place; 2. It will warm your mug up; and 3. It will rinse the filter paper. Don't believe us? Depending on your filter paper you will see that the water in your mug is yellowish. Taste it! Might taste like paper or bleach. You don't want that in your coffee. Pour that hot papery water out from your mug! Step 3: Add the appropriate amount of freshly ground coffee. You want to aim for a medium to fine grind (something resembling sand or table salt). Again, you will have to experiment with each coffee and make changes to your grinder. Step 3: Pour enough water over the coffee to saturate the coffee and then stop for ~30 seconds and let the fresh coffee bloom. We do a very quick stir to make sure all the coffee is being drenched by the water (this can be contentious!). Step 4: After waiting ~30 seconds continue to pour while making sure all the grounds are saturated. Again, you could do another quick (and contentious) stir of the coffee to make sure is all being extracted and settling well.